In 2014, the non-governmental organisation ‘We the Citizens’ attracted a large audience when it filed a writ petition in the Supreme Court of India questioning the validity of Article 35A. This was not the first time this article was questioned in court. It was also brought into the spotlight when Dr Charu Wali Khanna, a Kashmiri Pandit woman by ancestry, filed a petition to change the constitutional provision of Article 35A. She wanted succession rights in Indian-occupied Kashmir (IoK), despite being adjusted outside the state. Since then, this article’s hearing has been postponed by the court, considering how this legal matter will land the valley into an abyss of chaos. The petitioners challenged the article on two basic arguments. Firstly, that it was inserted into the Constitution through a presidential order and sidelined the basic functionalities of Article 368, which empowers the Parliament of India to amend its Constitution. Secondly, it infringes the basic structure of the Constitution. It should be noted that the Constitution of India can be amended numerous times, but these amendments shouldn’t alter its basic structure. The petitioners assert that the provisions passed under Article 35A are ultra vires (beyond the powers) of the basic rights guaranteed by Part III of the Constitution, mainly Article 14, which gives Indian citizens the right to have equality across the union of India. However, both these specious arguments have certain faults. The concept of equality applies to the whole union of India, including the states acceded with India. However, it does not apply in the real context when there is asymmetrical federalism. Asymmetrical federalism has been quite successful for India in preserving its unity and integrity, for the Indian Constitution purposefully mandates differential treatments for different parts of the Indian Union. Before understanding the faults, we need to look at the context that will help us make sense of the current scenario which has led to this sense of ambiguity. How was the article introduced? In 1927, Jammu and Kashmir was a princely state ruled by Dogra ruler Maharaja Hari Singh. When the state administration started hiring civil servants from outside the state, Kashmiri Pandits protested the hiring of Punjabis, leading to an agitation that eventually led to a law promulgated by the ruler. The law barred outsiders from acquiring immovable property and applying for vacant jobs in the state. Later, when the Indian Constitution was drafted, the definition of permanent residence was retained. Considering the sensitivity surrounding IoK, Indian President Rajendra Prasad issued an order to incorporate Article 35A into the Constitution in 1954. This gives special rights and privileges to residents of IoK and bars people from outside the state from acquiring immovable property in it. Broadly, it empowers the state legislature to define the state’s permanent residents and gives them certain rights and privileges in public sector jobs, acquisition of property, scholarships and so on. The provision also directs that no act under it can be challenged for violating the Constitution or any other law of the land. Does Azad Kashmir have a similar article? If we take a look at the other side, we will find a similar provision in Pakistan’s Constitution. Under Article 4 of the Azad Jammu and Kashmir Alienation of Land Act, 1995, anyone not a subject of the state is prohibited from purchasing land there, while Kashmiris are free to purchase property anywhere as citizens of Pakistan. It makes sense that given the sensitivity of the Kashmir issue, it is only the natives who are blessed with certain privileges. Should India scrap the article? The Kashmir valley is embedded in between hillocks and surrounded by the lofty Himalayas. Its scenic beauty, strategic location and important demographic means the law protects the land from getting overpopulated. The entirety of Jammu and Kashmir is an extremely fragile, ecologically vulnerable region; it cannot bear the brunt of overpopulation. Article 35A is thus one of the reasons that the demography of IoK has remained unchanged over the last 50 years or so, despite an attempt in the 90s. The government may have wanted to tinker with the article, but the environmental vulnerability may have been what stopped them. Its removal will invite more people to purchase land in IoK, which will possibly degrade the state’s environment. Will India scrap the article? It seems plausible that Article 35A might finally go, primarily because this was a promise made by the Bharatiya Janata Party (BJP) in its 2014 election manifesto. Citing current political upheaval, the BJP is left with only this attempt to try and politicise the Kashmir issue further and use it to help them attain more seats in the upcoming elections. After trying and failing in multiple attempts against Pakistan, including the “attack” in Balakot and the capture of India’s pilot, the entire symmetry of Narendra Modi’s campaign was spoiled, allowing this matter to rise again. It is becoming hard for the BJP to intrude into the politics of IoK. Despite having a government in the state, it consistently failed to breach its political hegemony. Now if this article is scrapped, it will possibly help them control the state, even without the support of the local natives. Notably, the current storm against Article 35A is based on the idea that the only way out of the Kashmir issue is for India to change the demography of the state by allowing outsiders to settle within it. On this basis, it’s not the Kashmir valley alone that would lose its special status; Jammu and Ladakh will equally bear the brunt. However, if Article 35A is abrogated, it may also jeopardise the accession of the state into the Union of India. It will also create a lot of questions in India regarding the legality of all presidential orders, leading to dissonance between the centre and the state. It’s because of these presidential orders that the articles in the Constitution of India apply to IoK. The defined constitutional relationship and the weak rope of attachment between India and IoK may get worse, to the extent of unmanageable chaos. 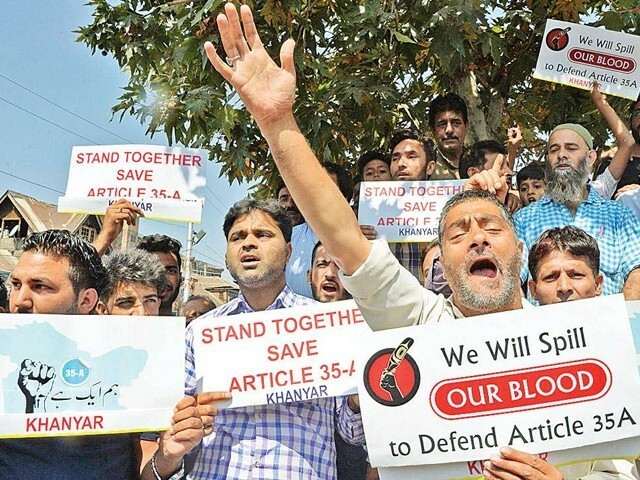 There is no doubt that abrogating Article 35A will only escalate the already tense situation and unrest in the valley, and may eventually culminate into a violent and unpleasant end to the relationship between the State and the Union. In any case, this move will definitely give rise to claims of self-determination, for the actual order issued by the United Nations to conduct a plebiscite, which has now been pending for seven decades, has not been forgotten.